Walking up to the first overlook of the 411-foot high Upper Whitewater Falls is a lways an impressive experience, no matter how many times I make this hike. Along with this expanse of natural beauty are two grim reminders of the foolishness of people venturing too close to the top or climbing on the falls – an old sign understating the number of people killed on the falls (now risen to 18 or more) and a large steel post anchored into the hillside above the overlook. This pole, and another one just like it at the base of the falls, supports a cable system that North Caroline Rescue Squads string up to hoist the injured or dead persons who fail to heed the warnings. Rerouting of the Foothills Trail and adding barriers discouraging access has only slowed but not stopped the deaths. 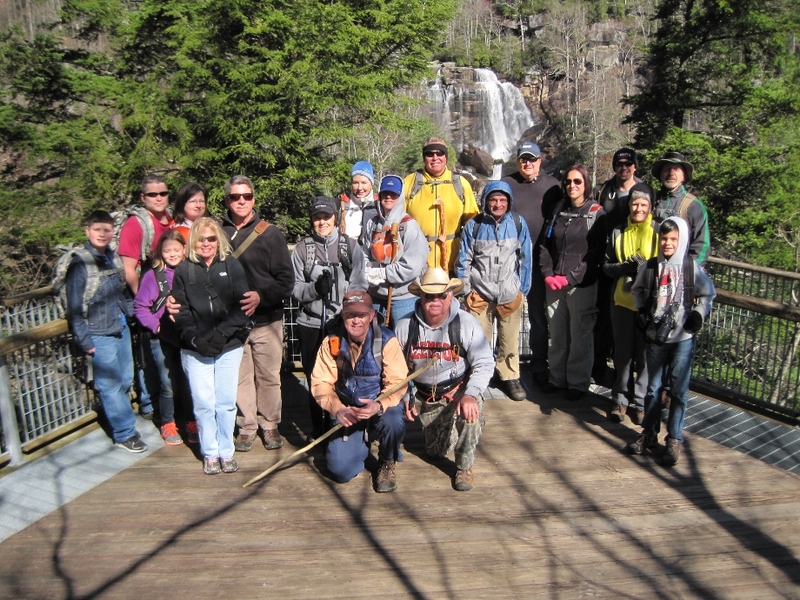 After a couple of group photos, with the falls in the background, we were ready for the real hike. Trailing Arbutus was growing along the upper bank to the trail, but not a bloom of its small white flower was to be found. Next, the early Toadshades Trillium (sessile flowers) with its mottled leaves were in the thousands covering the mountainside, but not a single bud was open. As we continued our 600-foot descent to the river, we found a few of the (stalked flower) trillium had come up, but no open buds. Note: With the mountainside covered in trillium, all with buds, the April Wild Flower hike should be a great success. We were not totally shut out from the wildflowers; violets were in full bloom. The Yellow Woodland species and the Halberdleaf Yellow and Common Blue were evident the total length of the trail. As we approached the lower bridge crossing the Whitewater River, something new has been added – a beautiful bench beside the river along with two plaques dedicated to long-term employees of Duke Energy and DNR who worked to study and protect this wonderful natural resource. As we exited the trail toward Bad Creek, an aroma of Sweet Pinesap could be detected along the trail indicating its presence, but we could not locate its brownish purple stems.